"36 Islamic detainees killed in Egypt." "Morsi supporters launch 'Day of Rage' in Egypt." "Despite Egypt's turmoil, Qatar sends gas shipment." Armed Forces Releases Footage of June 30 Protests From Helicopter - You though Occupy Wall Street was well-attended? The streets of Cairo are flooded with a sea of people. Rabaa's Second Massacre - Here's an album of intense photos also from August 14th, after the sit-in at Rabaa was dispersed. The photographer, Mosa'ab El Shamy "was detained and beaten by some vigilant checkpoint outside Rabaa. They stole his camera, but he was smart enough to hide his SD card in his sock." The Muslim Brotherhood's "Day of Anger" - The journalists at Vice get up close and personal when two Morsi sit-ins are cleared on August 16th. This video is a little graphic. #at=187">The Truth Behind the Current Violence in Egypt 14/8 - This video shows destruction done by Morsi supporters, such as killing police officers and destroying Coptic churches. Taliban Issues Statement Non-Ironically Condemning Violence in Egypt - Enough said. Mapping the Main Pro-Morsi Sit-In - This is a neat visual to understand the geography of the protests. 10 Things to Do During the Curfew - Just in case you're interested. 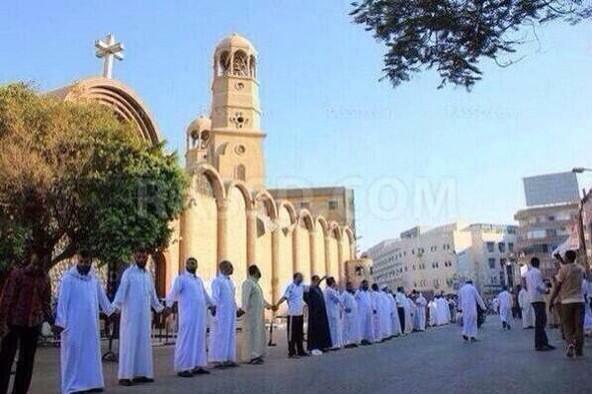 Muslims Protecting a Church in Egypt - This picture has appeared on many social media websites. A little hope for a dreary situation.